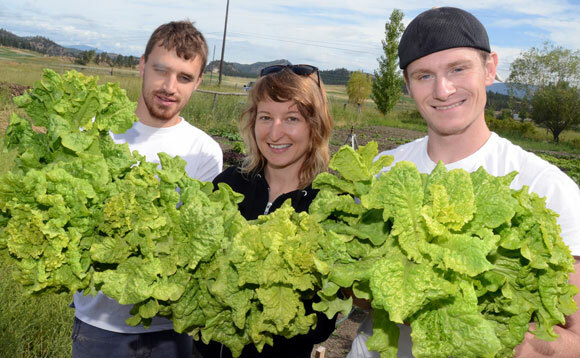 UBC political science and geography student Steve Schiffbauer, left, geography student Kathleen Taylor and psychology student Adam Kubel show off some of the produce grown at the Okanagan campus organic garden. A plot of land near the University of British Columbia's Okanagan campus is doing more than just growing plants. The acre of donated land is the site of the UBC Preservation Farm and Research Initiative (PFRI), but growing 100 per cent pesticide-free produce (based on organic principles) is only one of the benefits the soil brings to the campus and the community. Claude Desmarais, founder of the project and Reichwald Professor in Germanic Studies with the Department of Critical Studies, says the idea is to tie research and teaching to the garden. That connection is being made with three different program areas taking part in the green project so far. Students from a variety of faculties have created poetry for the garden, given workshops for PFRI members on writing about their experience, and conducted a sustainability study. A business plan has been developed and staff and faculty have come on board by donating funds to the project. Desmarais said donations from both on and off campus are vital to the project that employs students to tend the garden and harvest the crop. The latest donation was $2,000 from TD Friends of the Environment. "We're dependent on donations to put the students to work. We need the support of people to make this happen," he said. "Students have been very interested and engaged." Produce from the organic garden includes lettuce, peas, potatoes, squash, beans and more. There is also a small herb garden tied to PFRI. Some of the fresh food is given to the Kelowna Community Food Bank and Kelowna Gospel Mission in proportion to the amount of donations the program receives, with the remainder sold at the Kelowna Farmers' Market. Desmarais envisions additional students, staff and faculty getting involved and the garden becoming integrated with more university courses. He envisions spin-off programs such as research and training programs on healthy gardening, eating and cooking in collaboration with the community. The project also aims to provide support and information to other groups that want to integrate environmental sustainability, social engagement and research into an organic garden and research initiative.